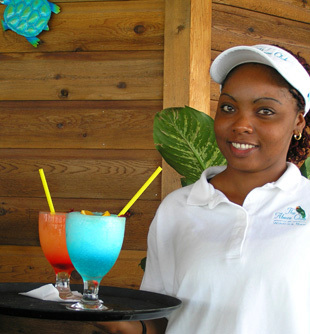 Whenever I think of food of the Caribbean, I immediately think of the freshest seafood, and at The Abaco Club on Winding Bay in Abaco, Bahamas, fresh seafood is de rigueur. 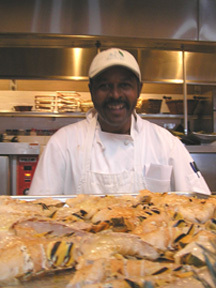 It was mid-December 2005; it was bitter cold in New York, so Edward F. Nesta and I decided to take a trip to the Bahamas to enjoy the warm weather and of course, the gastronomy that the Bahamas is famous for: fresh seafood, with lots of available spice! My first experience with Bahamian cuisine was over lunch at Busters at The Abaco Club on Winding Bay, and I loved every minute. It was a perfect afternoon sitting outside at a table with a view of the beach and the Sea of Abaco, and sipping a Bahama Mama (dark rum, light rum, coconut rum, pineapple juice, orange juice, grenadine and Angostura bitters). I was in heaven, as I tasted my first bite of one of my favorite appetizers, conch fritters, dipped lavishly in Caribbean hot sauce, and I even very generously shared one or two with Edward. I am passionate about conch fritters, and with each bite, I savor and remember every place that I have ever eaten them. I closed my eyes, enjoyed every last morsel, and committed it to memory for the next time I have them. As I finished the last of the fritters, my Island Lobster Pocket arrived, which was generously filled with sweet rock lobster meat, and accompanied with crispy French fries and a delicious tropical coleslaw made with pineapple. Edward decided to have a “naked burger,” but when he saw my Island Lobster Pocket, I saw him occasionally stealing glances at my lobster, and looking like he wished he had ordered it instead. After lunch, Edward and I played a round of golf, and it is amazing how the Bahama Mama helped me with my game; of course, if I had drunk two Bahama Mamas I might not have found my way to the golf course! In the evening, we drove our golf cart up the hill to the Clubhouse, where we had the most marvelous view of the Atlantic Ocean, and when we entered the Clubhouse we had a gorgeous view of the Sea of Abaco. The Clubhouse, with its wood ceiling and wood walls, was ready for the holiday season with a gorgeously tall Christmas tree that was decorated with starfish, and poinsettia plants graced each of the granite topped dining room tables. 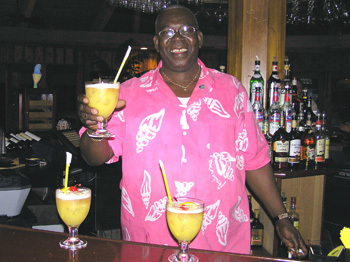 Bartender extraordinaire, Archie Symonette entertained the guests with his “Archie-isms” and his bartending skills. Although he was touting his Winning Winding Bay Winder, I decided to “just say no”, even though one of Archie’s favorite lines is “I wouldn’t say no”, and settled for a glass of wine instead. Executive Chef Samuel Favella must have known about my conch weakness when he was creating the Dinner Menu for the evening, as I was thrilled when I saw Lobster and Conch Chowder on the menu. Naturally, Edward and I selected the Lobster and Conch Chowder as our first course, and were rewarded with decadent creamy chowder, that was rich with generous conch and lobster meat. For our second course, we selected Grouper stuffed with Andros Crab served with a Sweet Caribbean Mango Chutney and Jasmine Rice. The grouper was a gorgeous presentation and taste of the Caribbean and was accompanied by deep-fried plantains and long plantain crisps, another of our favorite Caribbean foods. For our dessert course, Edward selected the Vanilla Ice Cream served with Candied Apples, and I selected the Mango Crème Brulée that was lovely, a silky custard with the delicate flavor of mango, and was the perfect finale to a wonderful evening. The next day, after a fabulous morning round of golf, we had lunch at the Clubhouse restaurant; Edward had another Bahama Mama, and I decided to try a new drink, the Bay Breaker, (dark rum, dash of vodka, Blue Curacao and lemonade), and although it was good, I think I prefer the Bahama Mama. 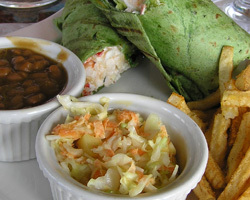 For lunch, Edward selected the Island Lobster Pocket to make up for his longing the previous day, and I had their Barbecue Gulf Shrimp Wrap, both of which were excellent. 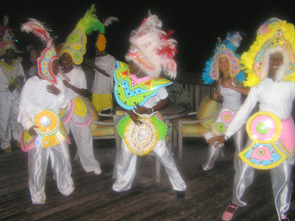 We returned to the Clubhouse in the evening for a special dinner, and were told that tonight there was going to be Junkanoo, of course, since this was our first time to the Bahamas, we had no idea what Junkanoo was, but we were certainly interested in finding out. Please read our articles on The Abaco Club in the Destinations, Hotels and Resorts, Chefs’ Recipes, Restaurants, Music Scene, Spas and Events sections. © March 2006. Luxury Experience. www.LuxuryExperience.com. All rights reserved.